What you don’t know could save you big bucks. With the upcoming Presidential elections, healthcare is an issue that you will find at the forefront of many political discussions and debates. For a country that has many social services (the military, intelligence agencies, highways, libraries, subsidized loans, police and fire departments, postal service, etc. ), the topic of socialized healthcare is a polarizing one. At the heart of the matter is the crucial issue of saving money on healthcare. Here at Penn Dental Medicine, we stay out of politics but we do know how important it is to receive good value. 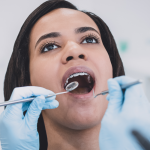 Our priority is meeting your dental care needs and answering your questions, such as this one: Can I save on my dental appointment? The answer is yes! How Much Can I Save On My Dental Appointment? The average dental procedure costs between .3% and 44.7% of the average family’s monthly income. Since the average family’s monthly income is $4,471, you could be paying anywhere between $13 and $1,998. With such an uncertain range of costs, it’s no wonder that healthcare is a hot-topic issue right now! Participate in medical studies, provided your dental needs match up with a clinical study in the area. 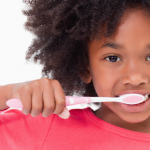 Use free or low-cost dental providers. The United Way provides a list of such services, but they are few and far between. Look for online savings. Some private practices offer seasonal discounts or deals to attract online customers. Find a discount dental plan. You pay to enroll, but you then receive discounts on certain procedures with certain dentists. Get work done by students. Dental Schools have clinics that provide a full range of dental services at roughly half the cost of a private practitioner. Ask for a discount. Moneycrashers.com has a ‘it doesn’t hurt to ask’ policy. Pay upfront. In California, many dentists give a 5% discount to customers who pay upfront. Go abroad. While this particular site advocates dental tourism, Penn Dental Medicine does not. Even the U.S. Government has warned against trying to save on dental visits with dental tourism; classifying it as risky at best and disastrous at worst. Barter your services. There is a possibility that a dentist might be interested in hiring a photographer or a web designer or an inbound marketing specialist to trade services with. However, that’s rarely a fair trade–that particular stick always has a short end. Get a job. Ironically, the best they could offer was that you get a part-time job with benefits. Granted, there aren’t many part-time jobs with benefits. 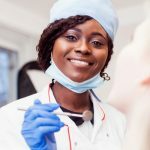 While Moneycrashers.com may have a few bright ideas on saving on dental visits, the only really reliable and practical advice on their list is the suggestion to go to a student dental clinic. 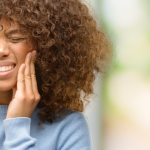 And while that might not be helpful advice for someone living far from a decent university, anyone living near Philadelphia is fortunate to be in driving distance of one of the best dental clinics in the nation. 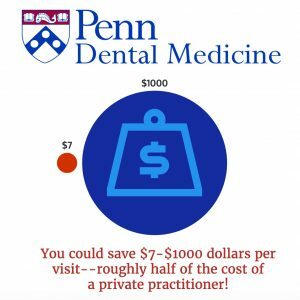 Let Penn Dental Medicine be the answer to the question, “How do I save on dental visits?” At Penn Dental Medicine, you could save $7-$1000 dollars per visit. Why wait? Call Penn Dental today and see just how much money you can save on dental appointments!